Hello, dear readers, I have a confession to make. I have been holding out on you! 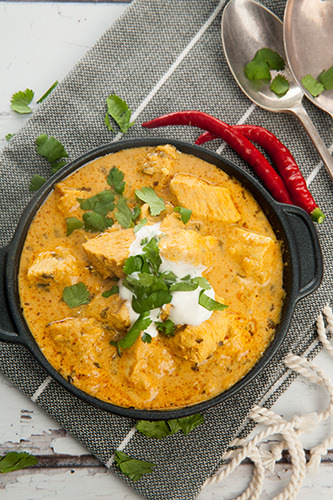 For the last month or more I have been making this simple Chicken Curry over and over again and I didn’t share the recipe. 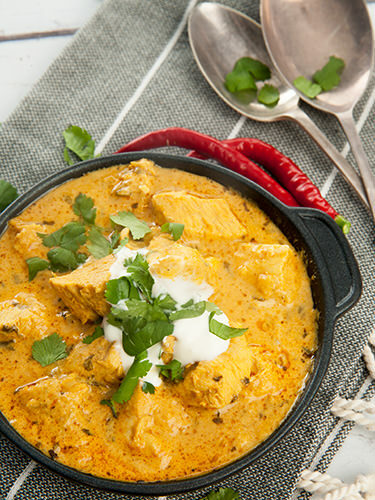 I feel really bad because it’s honestly the easiest and tastiest chicken curry you will ever make. The only reason I haven’t share the recipe before today is we keep eating it all before it can be photographed. If you don’t have a Thermomix please don’t be put off, the recipe is just as easily made on the stove top. 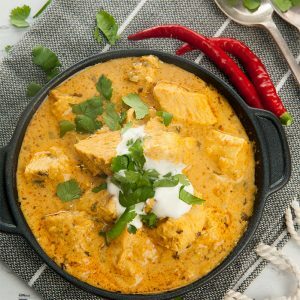 This recipe is one of the exclusive recipes I’ve included in my “An Indian ThermoKitchen” cookbook. 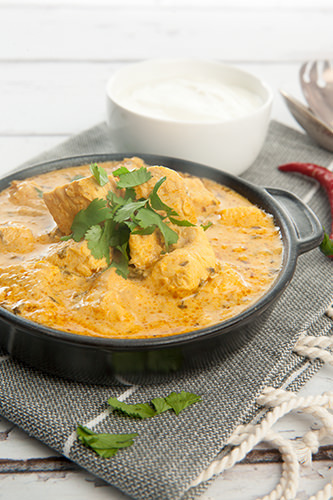 Before refining this recipe I honestly thought that making curry was best left to the local Indian restaurant. I was simply not able to replicated the flavours as closely as I wanted. 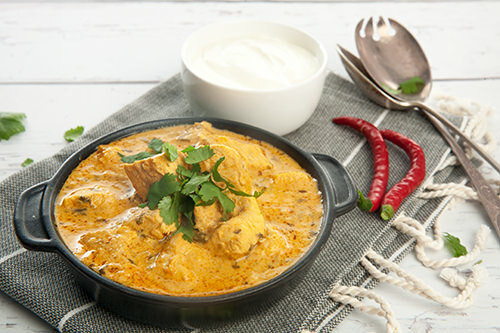 Now I am pleased to say my Easy Chicken Curry with Yoghurt has revolutionised my thoughts on Indian food. I have to admit I did get some help from one our local Indian Restaurant in Coffs Harbour. You see Coffs Harbour has the largest Sikh (Punjabi) community in Australia. I was lucky enough to grow up living next door to the family that owned the first Indian Restaurant in the area. After a bit of persuading, I have been able to coax the ingredients and method of one of my favourite curries from the chef. The recipe takes about 30 minutes from start to finish and is a healthy, creamy recipe. Everyone in our family loves the dish. Making this at home means that you can adjust the heat to suit your individual preferences. This an exclusive recipe from "An Indian ThermoKitchen" Cookbook. The calories could be further reduced by using low fat yoghurt. The recipe makes 6 servings of curry. I love that the recipe makes loads of rich sauce. 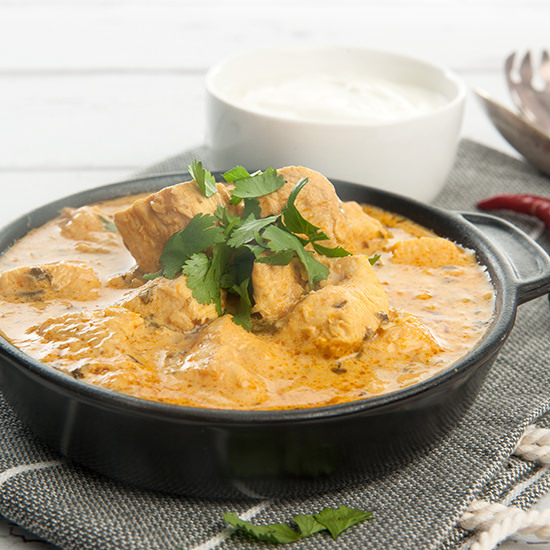 The perfect accompaniment to the dish is basmati rice and homemade Chapati. Chapati is a very simple flat bread, made with Atta flour. Atta flour is actually a wholemeal flour which has been ground very finely. Chapati dough is made by mixing the Atta flour with salt and warm water, so it really couldn’t be easier to make. Once kneaded until combined, approximately 2 minutes, the dough is formed into balls and then flattened into rounds. No oil is used when cooking the chapati so it’s actually quite a lean flatbread. I would love you to try this dish and let me know what you think. In all my recipe trials I have also substituted lamb in place of the chicken. I found it equally as delicious, and perhaps even a little bit more rich and tasty. 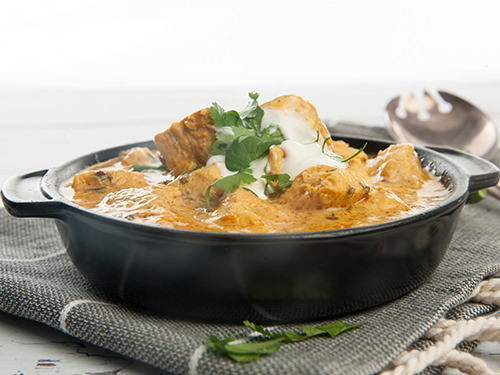 However, the chicken is so tender in the curry it’s still my favourite version. Make sure you pin and yum the recipe for later. 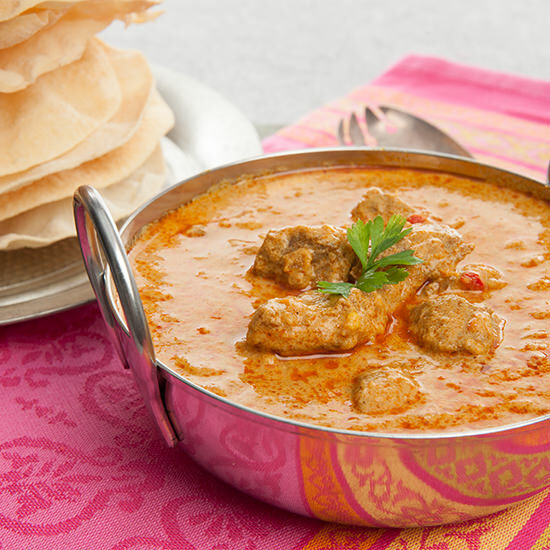 If you’re more of a Lamb Korma kind of person check out my Lamb Korma recipe. 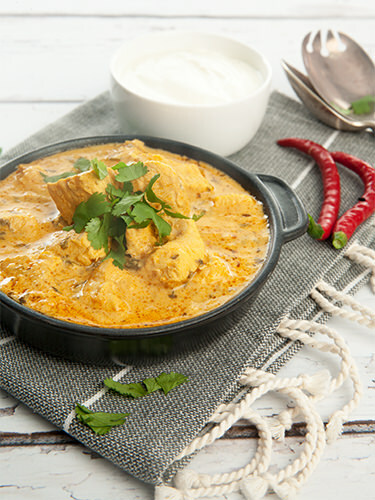 Easy Chicken Curry is one of 28 authentic Indian recipes contained in “An Indian ThermoKitchen” cookbook. A lot of work has gone into ensuring that all the recipes are delicious and will work every time! Take a look at all the other great recipes included in the book. Recipe Index An Indian ThermoKitchen.